If you’re in need of staging set up, AV equipment, or tradeshow displays, give our office a call today. We’ve developed proven systems for tradeshow management to maximize exhibitor exposure. For over 35 years our clients have trusted our expert consultants to equip and set up their events. Are you planning an event and looking for a reliable AV system for a presentation? Do you need the help of an experienced team to set up various equipment	for your special event? At Spectrum Audio Visual, we have many years of	experience handling AV issues for all types of events both large and small. If you are interested in learning more about our affordable services,	call us now at (303) 477-4456! Whether you are planning a convention and need a premier location or if	you are in need of reliable translation equipment for your audience, we	can help. Our Denver AV equipment rental is exactly what you need to ensure	your event runs smoothly and efficiently. We focus on the technical side,	so that you are completely free to focus on your presentation and special guests! Since 1982, we have served countless customers throughout the Denver and	Loveland areas with our industry-leading experience in our field. Nowhere	else in the Rocky Mountain region can you receive the kind of service	and expertise that we provide to our clients on a day-to-day basis. We’ve	been in the AV equipment and rental business for 35 years because of our	detail-oriented approach and dedicated customer service for all of your	audio and video production needs. Talk to us anytime you are planning	a meeting, presentation, conference, or trade show! One of the best parts about Spectrum Audio Visual is that everything you	need is under one roof. No other AV company has the equipment and service	– that’s why other AV companies come to us! We serve all of Colorado	and also the surrounding states. 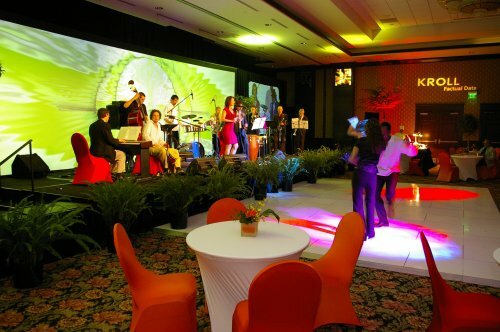 We have extensive experience with a large	scale of venues like convention centers in the area. For big trade shows,	we are frequently traveling to other states because our services are top	of the line. We take immense pride in the fact that our client base includes	other AV companies – we’ve been in business for over 30 years because	we know that happy customers are repeat customers. We love partnering	with clients of all sizes to help with their AV equipment solutions. Whether you are	planning staging and production, need	system integration and installation, or even need to	rent a computer, we are here for you. We offer	free estimates, so do not hesitate to get in touch with our qualified staff today to	set up your next event! For top-notch equipment and services that you	can count on to see you through your next event,	contact our office at (303) 477-4456.